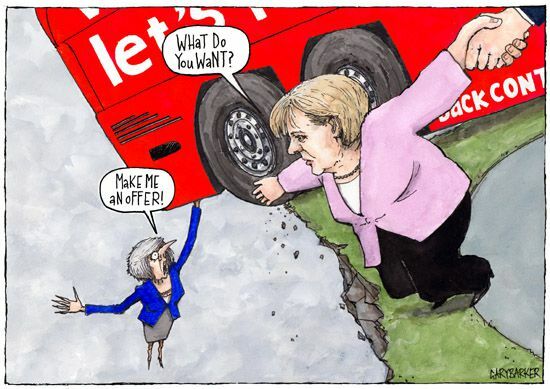 Theresa May cartoon, ridiculed by Angela Merkel for her ridiculous answer 'make me an offer' every time the German Chancellor asks her 'what do you want?' (from brexit). As also seen on ITV News. The Prime Minister in her much heralded brexit speech had pledged to outline her government's plan for brexit, but instead shed very little new light on what has become both a personal (for her) and national embarrassment for the people of the UK internationally. There now seems very little chance of anything positive coming our of leaving the EU for the UK, but rather this country will now almost certainly suffer both economically and structurally post-Brexit. We can now only hope that both the politicians who sold so many the lie that brexit would be goodo for the UK see sense and agree to offer the people and second referendum and the chance to put things right and restore sanity to the country.